6th match of ICC Worldcup 2015 was played between New Zealand and Scotland at University Oval, Dunedin today. New Zealand with superb pace bowling restricted Scotland on 142 runs and won the match by3 wickets. TA Boult (New Zealand) declared man of the match for his quick 2 wickets in beginning of Scotland inning. Earlier, Nwe Zealand won the toss and put Scotland into bat first. Scotland could not made batter start and lost 4 wickets very early in 4.2 overs. Only MW Machan 56 runs and RD Berrington played good cricket and Scotland managed to put very low score of 142 runs. Scotland all out in 36.2 overs. Following small target of 143 runs, New Zealand also struggled lot but manage to reach given total in 24.5 overs having lost 7 wickets. KS Williamson 38 and GD Elliott 29 runs were top scorer for New Zealand. Thus, New Zeland won the match and earn 2 important points in points tally of ICC Worldcup 2015. 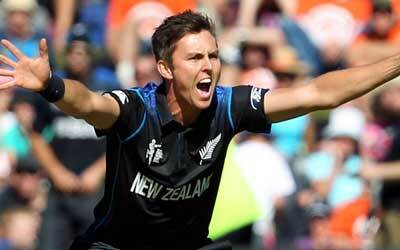 TA Boult (New Zealand) declared man of the match for his quick 2 wickets in beginning of Scotland inning.